Hello Shauna! I would love that!! I will link in sometime in the next few weeks!!! THANK YOU! How could this be adapted to use Nutella in place of the chocolate chips? An even swap? Why don't I read the comments before I try a recipe? LOL. 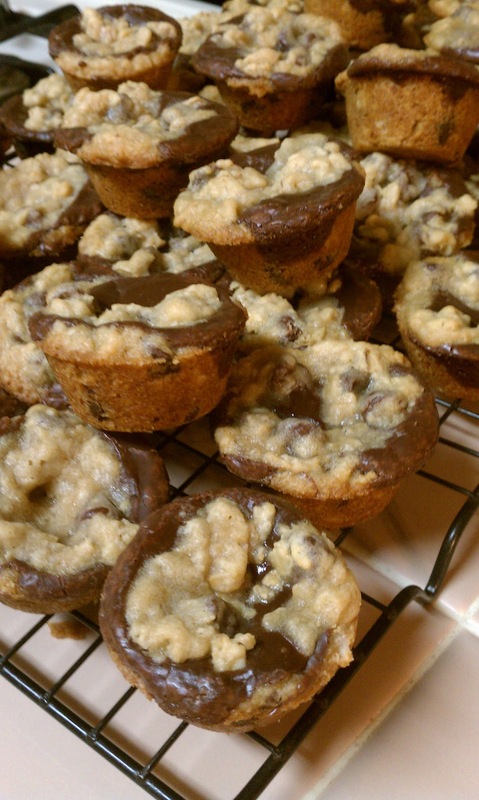 I just made these yummy cookie cups and didn't have enough chocolate chips. So I substituted nutella AND heated it up. They turned out fine, anyway! Thanks for the wonderful recipe! @laila-amy-111 Thanks!!! Did you make them??? How many does this recipe make? 24? @Vanessa, thanks for stopping by! It makes 48 cookie cups! I could have been more clear on that...I just mentioned spraying 2-24 count pans, but I will edit this to make it more clear! THANK YOU! I made these last night and the recipe made over 70 cups!! Not that anyone in my household is complaining. :) The only modification I made was to use teaspoons of vanilla instead of tablespoons. Yes! This recipe makes A LOT of them! :) It just depends on how much dough you put into the cups! Hope you guys liked them! These are a "go to" recipe for me! I made these to send to a friend who lives out of town... Unfortunately she only received half of the recipe because I kept the rest for myself! :) These were one of the most delicious things that I have ever baked. They remind me a little of the oatmeal chocolate chip cookies from Potbelly. Thank you for the recipe! Oh my goodness! I LOVE THIS!!! Thank you for sharing this story!! I think I would have done the exact same thing. Okay, okay, I confess...I HAVE done the same thing. :) Thanks again! I'm making these for a Bible study tomorrow night. The theme for food is something "mini" and I came across these. They look so good! Hello Ashley!! I love everything baked in mini muffin pans! And these sweet treats will definitely WOW everyone at your bible study! Let me know how they turn out!!! ENJOY!!! can you make these in paper muffin tin liners to make the removal from the pan as well as clean up much easier? "In another bowl, combine oats, flour, baking soda, and 1 teaspoon salt; stir into butter mixture. Stir in 1 cup of mini chocolate chips. Set aside." i am not seeing any indication of how much of the oat mixture to reserve for dotting the top before baking. i really want to make these for a camping trip this weekend. please help! Hello Melissa! :) Great question! Basically, all you need to do is fill each mini muffin tin half way with dough, put the chocolate fudge filling on top and there will be plenty of dough left over that you can place on top. There isn't an exact amount, but you will have more than enough left over. What a PERFECT treat for a camping trip!!! thanks for getting back to me! that makes sense. i think i was making it harder in my head then it is. making these today. cant wait to eat one! I made these for my family tonight and my son declared the dough heaven! (Yes we eat cookie dough...). They were a big hit as written. Thanks for an awesome new favorite recipe! Ann! Thanks for letting me know! 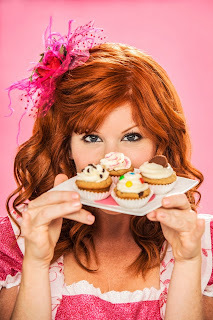 I am so glad you enjoyed one of my absolute FAVORITE "go to" recipes!!! Have a great holiday! Can you make these in regular muffin pans? If so what baking time? What would you recommend as a substitute for sweetened condensed milk...or would that change the whole recipe? Making these with my little boys right now! So far, so good....I will let you know how the first bite is! Thanks for the recipe! Fudge in the middle of an oatmeal cookie? Brilliant! Simply brilliant! Thanks for sharing this great recipe! Have made these twice to take to party and received rave reviews from all. I made again yesterday for a luncheon that was canceled due to weather. So my question to you is have you ever tried to freeze these and serve later? Great question! YES! I freeze these all of the time. Make sure they are in a tightly sealed zip-block bag and you can freeze these for several months! They will taste just as they did when you put them in the freezer IF you make sure no air touches them! :) When you are ready pull them out of the freezer and let them defrost on the counter! :) Enjoy! I pinned this recipe a while ago and finally made them today. I am obsessed with oatmeal chocolate chip anything, so naturally I loved these. Everyone loved them! My family, friends and coworkers! The recipe made enough for everyone, and I even put a few in the freezer. Thank you so much! Such a great treat! OOHHH!!! I am so happy to hear that you loved them! Reading this made me want to bake some up this week!!! Yummmmmm!!! !